April 15 is just around the corner, but you can lighten the load on your wallet with these Tax-Day deals for free food; buy one, get one offers; and discount coupons. Check out the list below for all the details and make Tax Day as painless (and delicious) as possible. 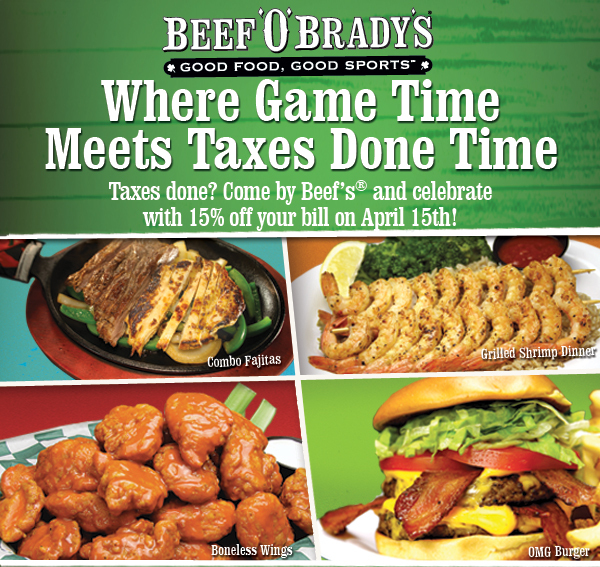 Beef ‘O’ Brady’s – Get 15% off your check at Beef ‘O’ Brady’s on April 15, 2015. Excludes alcohol. Bonefish Grill – Bonefish Grill has a coupon for $10 off your check, good through April 20, 2015. Good for dine-in only. For more details, check out our post: $10 Coupon from Bonefish. Brixx Wood Fired Pizza has a coupon for buy two entrees, get two free after 5 pm Tax Day. You can get your coupon from This Brixx Website. Print the coupon and present it to your server or display it on your smartphone to redeem. Bruegger’s Bagels – Bruegger’s Bagels will be offering their annual Tax Day “deduction” on Big Bagel Bundles from April 11 – 15, 2015. This offer is available for customers who are members of Bruegger’s Bagels’ e-mail club or who sign up for the program by April 9, 2015. Get a Big Bagel Bundle for just $10.40, a “deduction” of about $3.50. Note: You can also get a Bruegger’s coupon from the Bruegger’s coupon site; fill out the form and a new coupon will be emailed to you. California Tortilla – Get a free order of Chips and Queso (or salsa) when you make a purchase at California Tortilla and say the secret password, “Taxes Shmaxes”, on Wednesday, April 15. California Tortilla announced the offer on their website. Firebirds Wood Fired Grill – Visit Firebirds on April 15, 2015, and get 10% off your tab with this coupon. Please print the coupon or display it on your phone to redeem. Discount does not include alcoholic beverages. Dine-in only. Great American Cookies – Great American Cookies has their annual cookie giveaway to mark Tax Day on April 15, 2015. Get a free regular sugar cookie on Wednesday, April 15, 2015. No purchase required. For more details, check out our post: Free Cookie at Great American. Hard Rock Cafe – Visit a US Hard Rock Cafe on Wednesday, April 15, 2015, and sing your favorite song on stage to get a free Local Legendary Burger during Hard Rock Cafe’s “Sing for Your Supper” event. All ages welcome. Offer not available at Tampa, Fourwinds, Pittsburgh and Northfield Park Hard Rock Cafe locations. Visit the Hard Rock website for more details. Hooters – Hooters is encouraging fans to take their #EndtheIRS (“I‘m Really Starving”) pledge on Tax Day 2015 by enjoying all-you-can-eat wings at any of these Hooters locations all day on Wednesday, April 15. Offer valid all day; prices may vary by location. Dine-in only. Marco’s Pizza – Use the code 1040EZ to get a large one-topping pizza from Marco’s for $10.40 from April 15 through April 19, 2015. Click here to start your online order now. Valid at participating locations for a limited time. Price before tax and delivery charge. Not valid with other offers or deals. Orange Leaf Frozen Yogurt – Get up to 16 ounces of frozen yogurt and toppings for just $4.15 at Orange Leaf on Wednesday, April 15 when you “Like” Orange Leaf on Facebook and claim this special offer when it is posted on April 14. Offer valid at any Orange Leaf location on April 15 only. Show proof of claim via smartphone or printed confirmation. 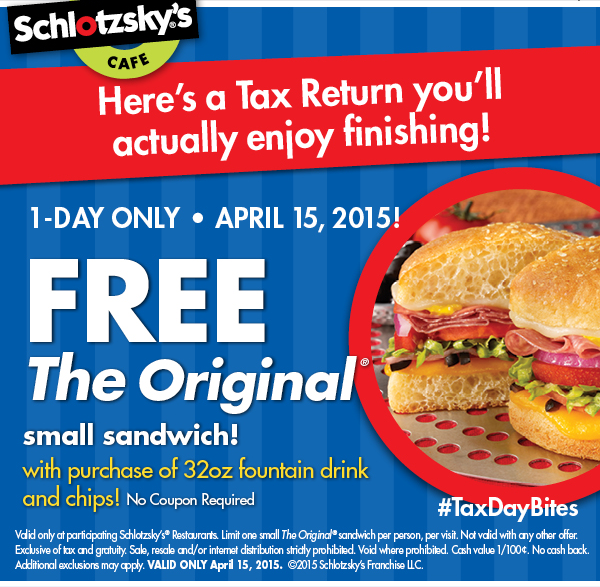 Schlotzsky’s Cafe – Schlotzsky’s is giving away a small sandwich with a drink and chips purchase on tax day. Buy a 32-oz fountain drink and chips and get a free small The Original sandwich, or upgrade to a medium The Original for $1. No coupon required. Good only on April 15, 2015. Schlotzsky’s had a similar deal in 2013 and 2014. More details in this email from Schlotzsky’s. Sonic Drive-In – Sonic has half-price cheeseburgers all day on Tax Day, Wednesday, April 15, 2015. There is no limit on the number of cheeseburgers you can buy while supplies last. Good on quarter pound single patty cheeseburgers only. Sonic announced the offer on their Facebook page. Sonny’s BBQ – Sonny’s BBQ is offering an “IRS”: Irresistible Ribs Special on Tax Day, April 15, 2015. Get a half-price rib dinner on April 15. White Castle – White Castle burger chain has a coupon for 14% off your order, good April 13-15, 2015. Visit this White Castle website for to get your coupon. If you enjoyed this post, check out Free E-Club Rewards to score more freebies just by registering for your favorite restaurant chains’ email clubs. Publisher’s note: This news article was researched and written by EatDrinkDeals staff members and was not sponsored by any of the entities named in the article, nor by any advertiser. EatDrinkDeals received no compensation for this or any other news article.